In this June 2008 video, Hank Needham -- later to emerge as a Club Asteria principal -- counts out a stack of £20 British notes delivered in a cash-gifting scheme. Using the pronoun "we" without defining who "we" was, Needham told viewers that "we" intended to open a cash-gifting "school." About three years later, Club Asteria positioned itself as an online "education" leader. In a March 2008 cash-gifting video, Needham was featured counting out a small stack of U.S. $100 bills. What was needed, Needham coached, was "training" on how to post cash-gifting videos on the Internet. Prosecutors say cash-gifting is illegal. The BBB calls it a pyramid scheme. In May 2011, CONSOB, the Italian securities regulator, blocked promos for Club Asteria in Italy. Needham has called himself a Club Asteria owner, and Club Asteria had described him as the director of sales and marketing “responsible for establishing Country, Regional and Network Team Leaders." 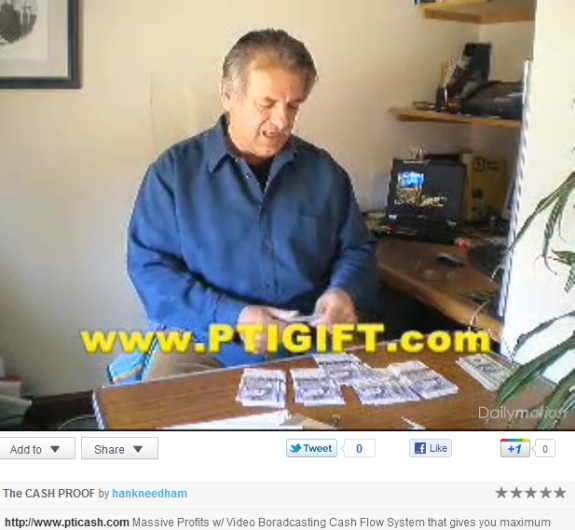 Another cash-gifting video from Needham — this one dated June 2008 — has surfaced. In the June 2008 video, Needham is holding an envelope from FedEx, another overnight courier. “Now, we have another [envelope] — I won’t really go through the courier — I don’t think we’re supposed to use this courier anymore,” Needham tells viewers, after making sure they notice what he describes as a “little pile of cash that’s accumulating” to his left. Various Club Asteria-related entities have been trading on the names of various charities, including the American Red Cross. The Red Cross sent the purported Asteria Philanthropic Foundation a cease-and-desist letter 11 days ago, and the relief agency said yesterday that the foundation agreed to stop using the Red Cross logo and other materials. How long it will take the Asteria-themed enterprises to comply is unclear. Needham’s image also appeared in 2008 promos for AdSurfDaily, an autosurf the U.S. Secret Service called an international Ponzi scheme. Before you take a look at the June 2008 Needham video — which appears to have been placed on Dailymotion just two months before the spectacular seizure by the U.S. Secret Service of tens of millions of dollars in the ASD Ponzi case — we’d like you to take a look at what the attorney general of Michigan says about cash gifting. Bill Schuette notes that purveyors can be charged with felonies. Mike Cox, Schuette’s predecessor as attorney general, said the same thing. Needham does not mention the law in either of his videos; he’s too busy counting bills. He appears to be less than pleased that “Robin,” unlike “George” in the other video, packed the bills tightly. It is unclear in either video whether DHL or FedEx left the envelopes in a secure place before Needham retrieved them. In other words, had the envelopes been left on Needham’s doorstep, they could have been stolen, an outcome sure to have created an unpleasant situation for both the senders and Needham. Perhaps he bought a whistle with the monkey he was sent? Hank’s phone number has a “01858” area code which is assigned to Market Harborough. This matches the address that was used at one time on http://www.club-asteria.com WHOIS. Thanks for those, Tony. Good grief. I’m now thinking that the videos perhaps both were made in March 2008, maybe sooner. The dates on the DailyMotion sites appear to be the dates the videos were uploaded, not recorded. Hank wasn’t the only one pushing the cash gifting scheme. Andrea was right there along side him. She just didn’t make any video’s to my current knowledge. And she was also in ASD along with Hank. Quite the pair wouldn’t you say? Quite the contrast from the Director of the World Bank image. Has links to ptigift.com (with Hank’s email address there and a +44 phone number, Nigerian style), and to ministryofcash.com at the time. both websites long associated with tax evasion and pyramid scheme activity. It seems Mr. Needham has progressed to the ability to use tools; he used a letter opener!!!!!! !